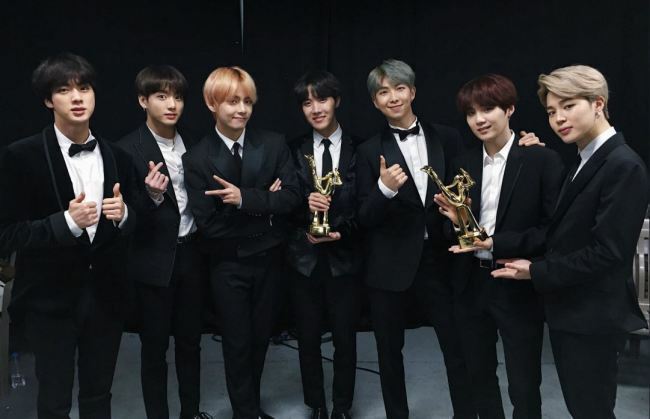 BTS won the Digital Bonsang and the Global V Live Top 10 Best Artist awards at the 2019 33rd Golden Disc Awards held Saturday at Gocheock Sky Dome in Seoul. “Thank you to our fanclub Army for streaming our songs, allowing us to win the Bonsang,” said Suga at the event. “We are working hard on new tracks to present our fans with good music. Thank you for waiting,” added the leader RM. This was not the end of BTS showing love toward its fans. BTS will hit the second day of the 33rd Golden Disc Awards on Sunday, emceed by singer Lee Seung-ki and actress Park Min-young, to perform on stage.